The Godfather's Blog: Larson On Newman: "I Completely Understand The Situation He Was In"
Larson On Newman: "I Completely Understand The Situation He Was In"
Kyle Larson commented today on his final-lap clash with Ryan Newman at Phoenix International Raceway, saying that while he was not happy with Newman’s tactics, he understood tem. Larson was 11th entering Turn Four of the final lap yesterday, with Newman close behind in 12th. Needing one more position to advance to the Championship Round at Homestead Miami Speedway, Newman charged onto the apron and made door-to-door contact with Larson’s Chevrolet. 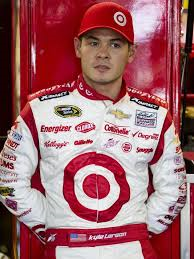 Larson brushed the wall and lost two positions, while Newman finished 11th, edging Jeff Gordon by a single point for the final transfer spot. "Coming to the finish, there were a lot of cars racing really hard,” said Larson today. “I knew (Newman) was right around me and knew he needed to gain some spots to keep from getting eliminated from the Chase. “It's a little upsetting he pushed me up to the wall, but I completely understand the situation he was in,” said Larson, “(I) can't fault him for being aggressive there. I think a lot of drivers out here would have done something similar if they were in that position." Class act. I'm going to enjoy the next several years with the likes of Larson and Chase Elliott. Agreed. There are some good, smart kids coming up. If the kid was smart which I know that he is, if he's battling with Newman for the win, it would be fair game for Kyle to use Newman's four wheels to help himself around the turns. Kyle seems to have it all - talent, equipment, brains and good looks, to boot. I just hope he doesn't turn into Justin Bieber. Can you imagine if someone did that to Newman, the hissy-fit would be off the charts! Great kid, great racer, he'll do it next year to newman as I expect Larson will be running for a homestead championship! he Wont have to do the same to newman as he is always faster, great talent, great attitude. I too look forward to seeing his success to come in the sport. I wish he was driving for a top tier team in both cup and Nationwide. Doesn't it seem like a bad plan to not establish what would get a driver DQ'd before the winner take all race. Or are we to assume nothing can get you DQ'd. NASCAR published its penalty grid before the season even began. And you think they've got the stones to DQ someone Sunday? They don't need to. Take 30 seconds to read the penalty grid, focusing specifically on the "loss of starting/finishing benefits" provision for P5 and P6 penalties. They can deny a team the championship without DQing them from the race win. And while you didn't ask this, I don't think anyone is stupid enough to come to Homestead and race for the championship with an illegal car. I wasn't talking about an illegal car, I'm talking about using another car to stop yours or moving someone out of the way or any of the other "boys have at it" moves that could easily be amped up to running someone off intentionally. Having watched the last two races it seems logical that the bar keeps getting raised on what is acceptable. Ryan uses the Brad Keloslowski CS race tactics, to get into the chase, "can't pass um , wreck um "
After allowing Larson’s dump job to stand on Monday night, NASCAR had no choice but to rubber-stamp similar results on Tuesday, making Self and Stefanik little more than ducks in a 600-horsepower shooting gallery. An event designed to showcase the best of American short track racing instead became a display of Neanderthal knuckle-busting at its lowest, least skillful level. If you can't see the difference between those two incidents, you must be blind, my friend.